Kids' Book Review: Review: Fly! Poor little Fly watches all the other insects and bugs in the garden 'Wiggle! ', 'Jump! ', 'Swing!' and 'March! ', but he just can't figure out what HE is supposed to do! 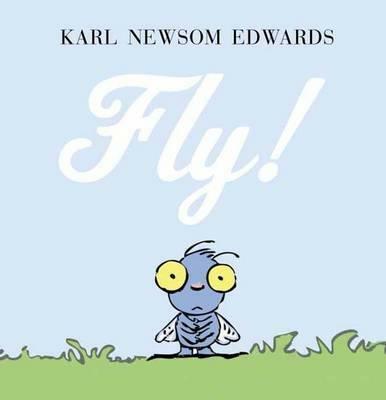 This picture book is wonderful in its simplicity, each page displays a new insect to explore and a new action that Fly tries to imitate, but no matter how he tries he just can't seem to get it right. 'Wiggle!' goes the Worm. 'Wiggle?' goes Fly. No. 'Jump!' goes the Grasshopper. 'Jump?' goes Fly. No. With each new action, Fly gets more and more distressed, until he sees a Bee 'Buzz! ', a Butterfly 'Flutter!' and a Dragonfly 'Flit!'. Fly gets an idea, can he Buzz? Flutter? Flit? Yes, he can FLY! The overall presentation of this book is lovely, right from the beautiful end pages covered in winged things, through to the big eyed, baby-esk illustrations of different bugs and insects which are completely devoid of any ick factor for those who might be a little bug squeamish. While the language is very simple and the story itself quick to read, there is still plenty to talk about. Young readers will delight in naming each insect and action, and exploring the 'Bug Facts' pages at the end of the book, which include more realistic illustrations of each bug that appears in the story alongside a single sentence of factual information. Fly! would be a great cross over book to begin shifting very young readers between fiction and non-fiction books.